One of these objects is Messier 21 (aka. NGC 6531), an open star cluster located in the Sagittarius constellation. A relatively young cluster that is tightly packed, this object is not visible to the naked eye. Hence why it was not discovered until 1764 by Charles Messier himself. It is now one of the over 100 Deep Sky Objects listed in the Messier Catalog. At a distance of 4,250 light years from Earth, this group of 57 various magnitude stars all started life together about 4.6 million years ago as part of the Sagittarius OB1 stellar association. What makes this fairly loose collection of stars rather prized is its youth as a cluster, and the variation of age in its stellar members. Main sequence stars are easy enough to distinguish in a group, but low mass stars are a different story when it comes to separating them from older cluster members. Once you have become familiar with the Sagittarius region, finding Messier 21 is easy. It’s located just two and a half degrees northwest of Messier 8 – the “Lagoon Nebula” – and about a half a degree northeast of Messier 20 – the “Trifid Nebula“. If you are just beginning to astronomy, try starting at the teapot’s tip star (Lambda) “Al Nasl”, and starhopping in the finderscope northwest to the Lagoon. While the nebulosity might not show in your finder, optical double 7 Sagittari, will. From there you will spot a bright cluster of stars two degrees due north. These are the stars embedded withing the Trifid Nebula, and the small, compressed area of stars to its northeast is the open star cluster M21. It will show well in binoculars under most sky conditions as a small, fairly bright concentration and resolve well for all telescope sizes. Here’s a beautiful deep look at a wide-field view of the Lagoon Nebula (M8, NGC 6523) and the Trifid Nebula (M20, NGC 6514) along with star cluster M21 and star forming region NGC6559. Amateur astronomer and astrophotographer Terry Hancock from Michigan says this is one of his favorite fields of view to observe. However, right now it’s very low in the southern sky and therefore limited to a couple of hours each night. Just wait until next month, and this region will be higher in the sky for better northern hemisphere viewing. 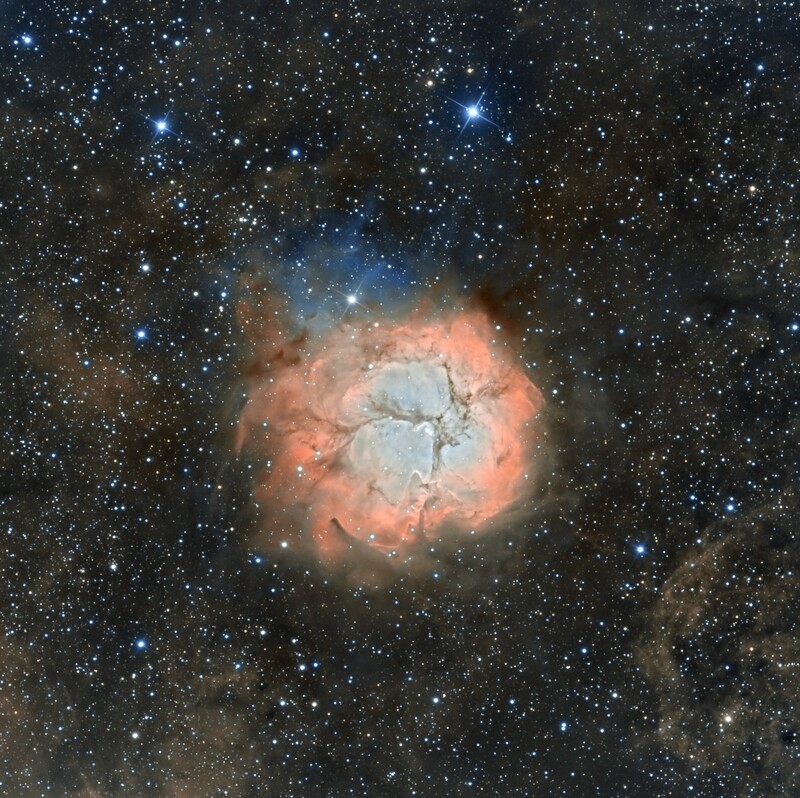 Terry captured this view in H-Alpha plus RGB over 4 nights. “Both of these objects are intensely rich with HII regions. Right of center is The Lagoon Nebula, a giant emission Nebula and HII region, bottom center can be seen the star forming region NGC6559 , these are estimated at 4,000 to 6,000 light years from us in the constellation Sagittarius. Upper left in this image can be seen M20 or NGC 6514 known as The Trifid Nebula also in the constellation of Sagittarius and lies at a distance of approximately 5000 light years from us. Just a really stunning “deep and wide” view of this region of the sky. See more of Terry’s work at his website, The Down Under Observatory (he’s originally from Australia) or on Flickr or Google +.